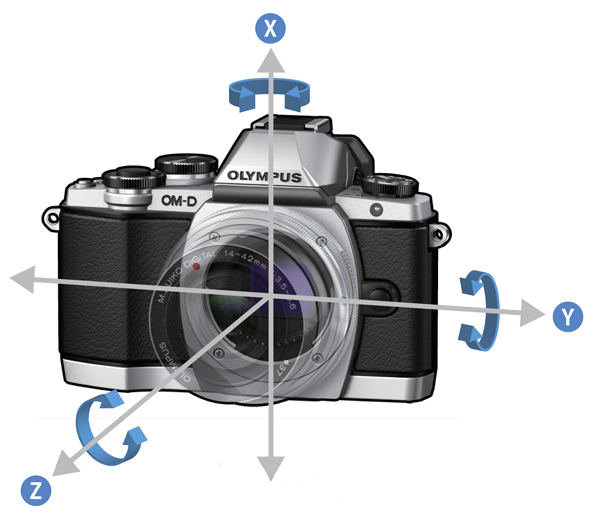 To keep the size of the E-M10 down, Olympus has omitted horizontal and vertical shift axes, limiting the stabilisation system to just three (see diagram, right): yaw (x), pitch (y) and roll (z). Where this reduced stabilisation is most noticeable is in macro photography, stills with shutter speeds slower than 1/15sec and video. Using the E-M10’s M.Zuiko Digital 14-42mm kit lens and the 25mm f/1.8 macro lens, I tested the 3-axis system by taking images handheld at 1sec, 1/1.6sec, 1/2sec, 1/8sec, 1/10sec and 1/15sec. At 1sec, the E-M10 showed significant shake and of six attempts I only managed to capture one image that was remotely stable. As I increased the shutter speed to 1/8sec, the sharpness improved enough that I was able to capture an almost shake-free image without having to regulate my breathing too much. Between 1/10sec and 1/80sec, it is possible to capture sharp images handheld in low light. The added benefit here is that you can shoot at relatively low ISO speeds as well, reducing the impact of noise. To deal with the limited axes, Olympus has included Movie IS, developed as a hybrid stabilisation solution for the E-M10, utilising electronic image stabilisation in conjunction with the 3-axis system. During movie mode, the systems combine to make adjustments to the pixels used by the sensor, thus reducing video wobble.